New Projects – Our New Form of Artistic Installation aka ‘The Quilt’ Is Ready! 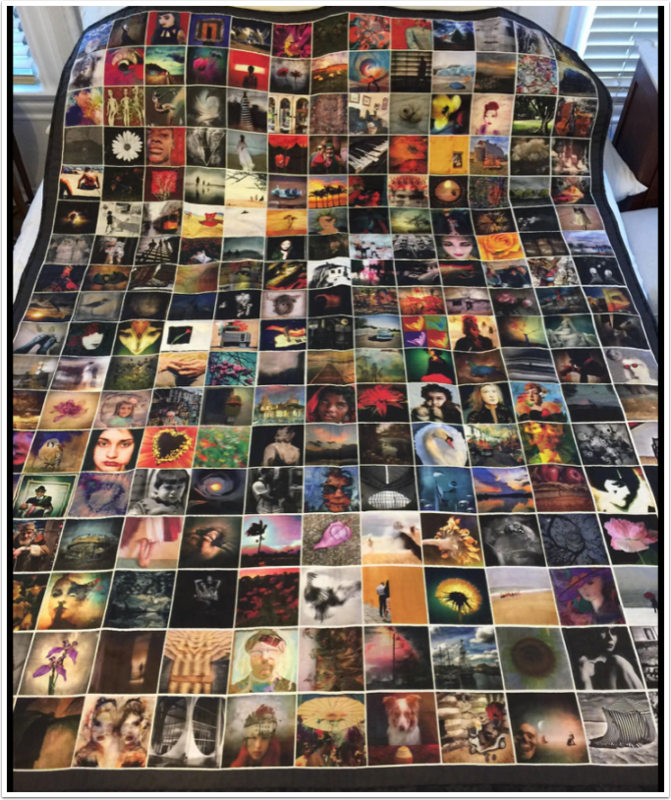 We’re delighted to inform our readers that the quilt that so many of you contributed to, has now been completed. 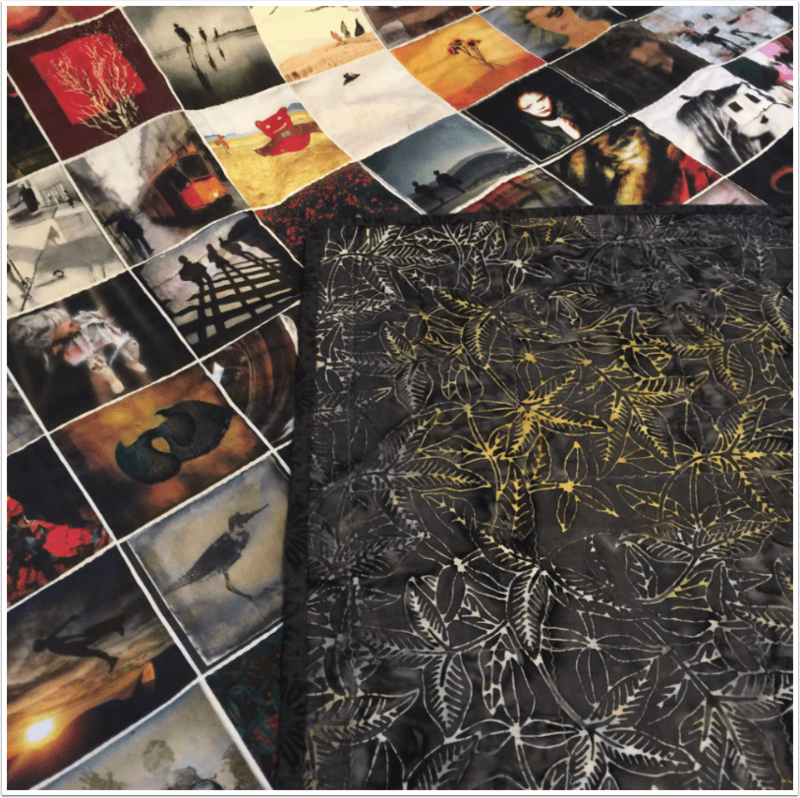 For those of you not aware of this project, it involved mobile artists contributing one image and each one was then carefully included within a large quilt to be displayed at the next gallery show or even Mobile Arts Festival. There has been a few obstacles along the way and we have overcome each one. This quilt was sewed together and finalised by none other than mobile artist, Lorenka Campos’ mother in law. We all owe her much gratitude. The quilt is now with Lorenka Campos, so if you would like to display it at your next event, please contact her for details. I have also been reminded and I shouldn’t have needed to be however, “Linda Toki did the whole layout of the quilt and had it printed. She also spent days working on the catalog so I really think she deserves a shout out as the quilt would never have happened without her”. We all need to give huge thanks to Linda M. Toki – join me!! Read moreNew Projects – Our New Form of Artistic Installation aka ‘The Quilt’ Is Ready! Shirley Drevich, Cara Gallardo Weil, Armineh Hovanesian, Connie Gardner Rosenthal, Ruud Engenhulst, Heline Lam, Vivi Hanson Sacerdote, Paul Moore, Angelique Manchandra-Peres, Hennk Goossens, Louisa Dawn, Marie Raffalli, Jean Fabien, Giancarlo Beltrame, Marian Seid Rubin, Ger van den Elzen, Travis Jonathan, Jaime Glasser, Diana Nicholette Jeon, Mikey Dela Pena, Patricia Truchsess von Wetzhausen, Catriona Donagh, Alon Goldsmith, Rosanna Cappiello, Mutz Feldz, Manuela Matos Monteiro, Christophe Gremaud, Ana Vicente, Meri Walker, Lena Vogt-Kist, Lisa Peters, Headattacks Crealitys, Nate Rabe, Andrew David Shaw, Lecia Badran-Doane, Tk Tran, Nickys Side, Henk Goossens, Paulo F Correia, Sandra Belyea, Jessy Colossus, Marianne Angelo, Donna Donato, Jannet Pieters, Azisah Abdul Aziz, Susan Rennie, Dilshad Corleone, Roger Guetta, Sheldon Serkin, Noah Fentz, Jennifer Molley Wilson, Paulo F Correia. Bobbi McMurry, Maria Columbu, Natali Prosvetova, Fiona Christian, Noel Villa, Jessika X Johansson, Leslie Kelly, Cynthia Westover, Susan Lindner McKeown, Paula Betiem, Valentina Usai, Sandra Belyea, Claire Le Roy, Roberto Murgia, Christine Mignon, Eric Rozen, Rosangela Usai, Matthew Wylie, Cindy Buske, Matt Strelecki, Gianluca Ricoveri, Giulia Baita, Brooke Zwerner, Kerstin Fiebig, Jeff Burgess, Dani Salvadori, Kathleen Magner Rios, Adrienne Parks, Marcey Dainey, Sabine Gromek, Ile Mont, Luigi Puddu, Gisele Didier, Nettie Edwards, Annie Helmsworth, David Frederick Weil, Imge IIdem, Murilo Nunes, Herve Bessege, Marianne Angelo, Adrienne Parks, Luigi Puddu, Sofia N Haggbom, Javier Ruiz, Pauli Paulina, Anders Wesslen, Lee Atwell, Vanessa Vox, Rita Mes, Adelino Marques, Erik Elferink, Gillian Brodie, Luigi Puddu, Christine Ann, Paul Posadas, Imge IIdem, Noriko Noriko, Jennifer Molley Wilson.